From last couple of days i was planning to read about "Blazor", just saw your article. Thanks! For such a nice article. I'm more interested to know about its practical use like what kind of applications can gain advantages from this framework? I read a lot about Blazor but I always see the same example of the counter. We need more samples of more "real-life" projects. And I want to use this, ofc. I really can't see this as a good idea in any context. Chris - then it's probably not for you. But there's a ton of people excited about this - not just with C# but with Python, Elixir, Go, and a ton of other languages. @Chris Why isn't a good idea? Without giving a reason, it just sounds like you're trying to spread FUD. I see this as a great idea: C# is my preferred language. It has strong typing. I can share models and validation logic between client and server side. 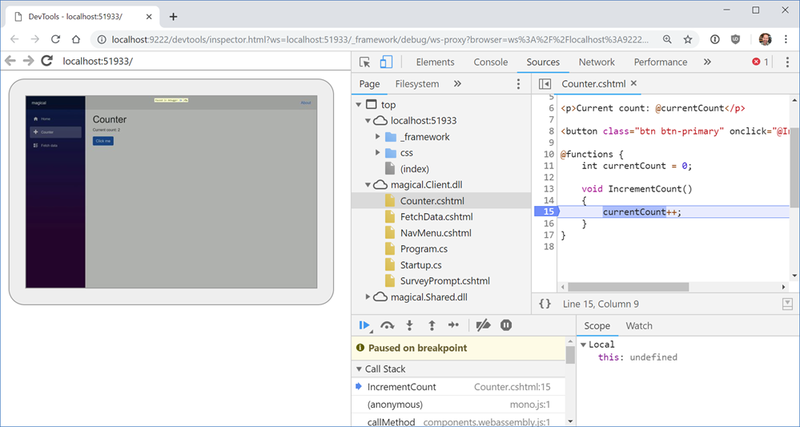 I can take advantage of a number of libraries that will run directly in .NET on the browser. So, everything that was new again that was old is new again. It's the whole thin client / fat client cycle repeated yet again. Thanks for introducing me to this to Twitter earlier! I have to admit I was skeptical at first, but I now see a lot of potential for this approach. Currently I think the biggest obstacle for the pure client side version is payload size, but maybe this will improve over time? "This doesn't require Web Assembly on the client, the .NET code runs in the .NET Core CLR (Common Language Runtime) and has full compatibility - *****you can do anything you'd like as you are not longer limited by the browser's sandbox****"
Depending on what Scott means by this then this is VERY bad. The server being able to do anything it wants on your machine because the browser sandbox no longer matters would be a gaping security hole. I'm presuming though that Scott does not mean what he wrote in terms of the obvious literal mean the words have. What I'd like to ask is - can Blazor be used on .NET full fat or is this another .NET Core only feature? I would love to find the balance between SSR Razor Components and Blazor Components. How could we mix the two, based on features? Some PWA features need to work offline, so Blazor is better choice there (eg. service worker management). If the separate server/client states were automatically distributed (eg. Ignite.NET), on-demand functionality could move to/from client as needed, providing interesting opportunities while minimizing client resources. Also, has there been any interop testing with Blazor Components against other WASM languages (Python, Elixir, Go, etc.)? It was at first confusing to read the term "Razor Components" as being something other than View Components in Razor pages (link). The names are too similar to me. It has also been up to this point easy to know there is a difference between Blazor and Razor pages. I'd feel on more stable ground if the term for "Razor Components" could be flipped to "Blazor Components". But powers that be have determined it otherwise it would seem. I have View Components working in my site and I do like the newer organization in Razor Pages. After a fairly quick learning curve I feel really productive using those. All the talk about Blazor makes me wonder if Razor pages will be thrown by the wayside in terms of popularity. It will be interesting to see how Blazor evolves. 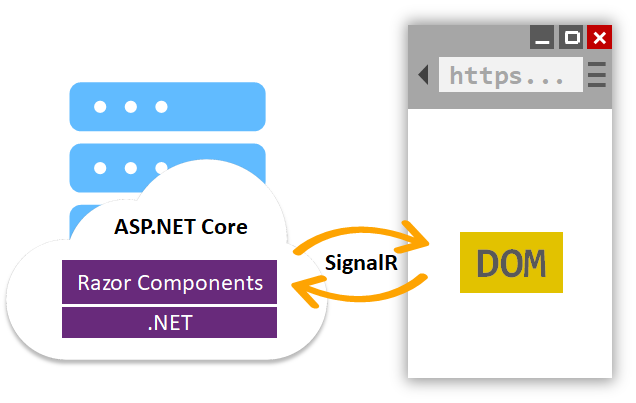 We've integrated the Blazor component model into ASP.NET Core 3.0 and renamed it to Razor Components. 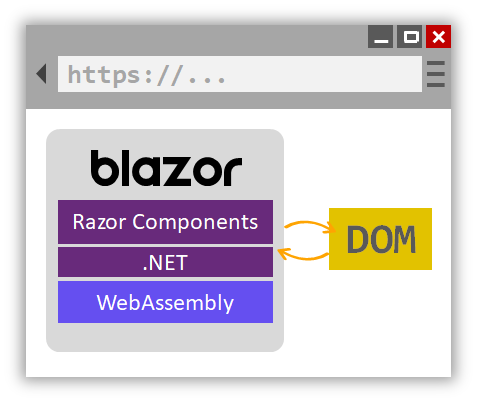 Blazor 0.8.0 is now built on Razor Components and enables you to host Razor Components in the browser on WebAssembly. "You may have written Razor in the past in .cshtml files, or more recently in .razor files"
I haven't found any explanation for the .razor extension. Yes, I think you understand my point that Microsoft has chosen to obscure the name of a technology, again, and is creating yet another round of confusing marketing around what should be a technology that can be clearly judged by its own merits. Call all the things that work in a Blazor architecture simply, "Blazor". Don't conflate the use of the @ symbol as being "razor" as that is a relic of Asp.Net development paradigms. This is new and different, worthy of its own name, and should be clear instead of muddled. Or is this really razor syntax (the @ symbol) that can be used in Blazor, a new technology? And Razor syntax is not Blazor but Blazor can interpret Razor syntax? Looking for a consistent naming convention, that's all. Hi Scott, Thanks for the well informed post. I've seen a few Blazor articles and videos and this one is clear and concise. I'd would like to know your thoughts on a comparable tech, Ooui (https://github.com/praeclarum/Ooui), which also converts C# to wasm but goes a step further and uses Xamarin.Forms to create web elements. to page bodies for people who have Arabic as their preferred browser language? I always used to write Stylish/Greasemonkey scripts for your blog to remove that attribute, but it should be removed from the source as all the content is already in English. Hi Scott, Thanks for this post. I know it's not possible but i wish blazor could just be a middware that you add it the request pipeline then Bibbidi Bobbidi Boo. For all I know middware always performs magic. By the way. Pls did you mean Razor Components can be added to an exiting asp core application to perform the work of blazor.